I'm working tonight and working out afterward, so I won't be home until late. Knowing this, I prepared myself a snack bento so that I could have then energy to work a meeting AND workout without falling apart. I usually don't share my snack bentos, but I like this one. It isn't anything fancy, but I thought it was looking pretty. On the left I have the rest of the lettuce with little tomatoes. On the right I have some of my yellow carrots. I got them at the Embarcadero market (inside the building, not in the Farmer's Market) and they are delicious. Finally, I have a container of homemade hummus which is without oil or Tahini. Hopefully this will tie me up until tonight! Yesterday we went to the Farmer's Market at the Embarcadero. To read about our adventure click here. After that we came home and decided to BBQ. My husband is the grill king, so it was truly delicious. I used the leftovers to fill the bentos. In the top tier (left) I have grilled zucchini mixed with seasoned fresh tomatoes (bottom), and I have sliced plums and I think a kind of pluot, but I'm not sure what that one is. I got a little overwhelmed at the Farmer's market yesterday. In the bottom tier (right) I have grilled chicken thigh (bottom), and couscous that I decorated with shredded carrots and nori "stars". I decided to use one of my new bento belt to add to the cutsiness! Top tier (right) there's cut up plum and friend, grilled zucchini and seasoned tomatoes and BBQed chicken thigh. It was delicious last night so I'm optimistic about lunch! I still haven't made Oyakis or Black bean mini burgers yet. I'm on it! I'm still working at making lunches for me and my husband in a quick easy manner, taking in consideration the difference in caloric needs! Today I went to extremes both ways! In the top tier I have steamed veggies (broccoli and peas) and carrots confetti's. In the lower tier I have a tomato-cucumber salad, 5 medium shrimps (steamed) and about 1/4 of an orange, sliced. All in all, my box is about 2 POINTS. I'm home so I'll most likely have a soup to go with it cause I went overboard with the "eat light" thing. In the tier to the left he has 2 Onigiri (with peas "fish" on top!) and 2 bento servings of BBQ chicken. In the tier to the right he has steamed veggies, cucumber pieces with a container of guacamole, 2 piece of Babybel light cheese and a few slices of orange. So his box is 9-10 POINTS (I'd say 9 because he doesn't even have a TBSP of guacamole). Sooooo, that's our Bento-ing for today. I was playing around with foods as usual and am getting better at figuring out what will be satisfying for us. I don't usually give the POINTS and will not continue to do so, I just wanted to show that boxes that are close in size can have a big difference in calories. It's a learning journey, but it's a fun one! Tonight my husband did his BBQ Chicken again. This time he used chicken breast that he cooked himself instead of using prepackaged chicken. He also doubled the recipe so that we could freeze leftovers. We ate out due, and then vacuum sealed the leftovers in bento size portions ready to freeze! Ready to go in the freezer! We label everything now. I've had a few times to trust my luck on "surprise tupperwares" so now I make sure I know what's in there! I put on the label what it is, the number of Points and the date it was put in the freezer. That way I can be careful to rotate so that foods don't stay in the freezer too long. So there, I have 5 days of "bento proteins" in the freezer ready to use. Since that recipe is so spicy, one of those bag is enough for both our bentos, served with a grain, and maybe some beans, it'll be perfect! I'm in a "play with foods" phase. I've revived my Lifestyle blog and am making an effort to try new things on regular basis. That will most probably show in my bentos as well as my other meal. In the top tier (left) I have pork cooked in papaya and mango salsa (Trader Joes) to which I added minced vidalia onion, and a diced mango (I added cumin and chili powder to the pork before cooking it); With that I have steamed broccoli and peas with garam masala. In the lower tier (right) I have a rather plain couscous, steamed lentils (Trader Joes) and two lychee that I pre-peeled to make them easier to eat. I talk about my "lychee discovery" in my Lifestyle blog. I've been trying to work on making two bentos in the morning, taking in consideration that my husband needs about half again as many calories as I do. I don't want to make different dishes, mainly because it's too much work, so I'm playing with quantities, and extras. He has basically the same foods. In the top tier (left) he has pork and salsa; he also has steamed veggies,; I added as "extras" 2 light Babybel cheeses and 1 espresso chocolate candy*. In the lower tier (right) he has twice as much couscous as I have; he also has steamed lentils (trader Joes). I used some of the steamed peas to decorate the couscous and the pork dish. I thought it would add a little color where color is needed. So there! that's my bento adventure for today! 1- cutting my vegetables ahead of time and how to keep them. 2- Making "pointy shapes" in carrots and cucumber to see if the edges would stay up. They did! Today I used my new round box I got at Kamei, only I used only 2 of the 3 tiers. Each tier is 300 ml. Top tier has a broiled Onigiri, a sliced hard boiled egg, and alternated orange slices and strawberry slices. I used my cheapos egg slicer I got at Ichiban Kan to slice the egg and then tried it on strawberries. It works, but I have 2 container of strawberries, one real fresh, and one a little older, it works much better on fresh strawberries! In the lower tier I have vegetable curry (top left), cucumber and carrot flowers and stars, and cherry tomatoes. The whole box has very little calories, it's mostly veggies! I got proteins out of the egg, and complex carbs out of the Onigiri (made with brown rice). That contest just gave me the kick in the behind I needed to get into creative mode again! Next time I go to Daiso I might just grab a few things to make a contest of my own! Have fun today! Happy Bento everybody! That's today's box! I used my new Hakoya box and was playing with the layout, how much I can fit in etc. That contest is going on for another week, so I might just send some more lunches! Ah! Lower tier: Leftover roasted chicken marinated overnight and browned this morning; Bulgar that soaked in chicken broth with salt, pepper, and sun dried tomatoes (not in oil); Container of Mediterranean Hummus (home-made, delicious); 2 asparagus ends to decorate. Top tier: Strawberry-mango skewers; Steamed asparagus and zucchini (with mirin added to the water, yum!). Top tier: I cubed the strawberries and mango instead of making skewers, I also added 2 mini Babybel light cheeses cause he likes them so much and he DOES need a lot more calories than I do. In the middle he has the same mix of steamed veggies I have in my box. Lower tier: He also had more chicken than I do (about double) and the rest of the Bulgar/sun dried tomato mix. So, that's today's bento adventure. 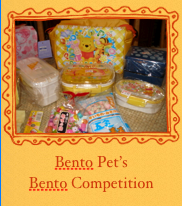 I really think it's cool to have a bento contest that doesn't include the "character bentos". Though I really REALLY am impressed by those masterpiece, it's cool to see us, simple everyday bento-makers be recognized! Added Note: This was one of the tastiest bento I've made! The marinade for the chicken was simple teriaki sauce. I ate that mixed with the bulgur, and had the hummus with the veggies. Oh my, I had a whole day to myself in San Francisco! I saw on Biggie's blog that Kamei were selling some coolish bentos, so I stopped by to take a look. The ones I had seen on her site were ok, but not what I'm looking for, but then I saw two that I just had to have! This is a Hakoya box. It's looks very well made, the sides are thick and the box is light but sturdy. The lid (inside) also seem to fit very well (not like the cheaper boxes that you're never sure if it will stay on). From what I could understand (I don't read Japanese, so I kind of look at pictures a lot!) the lower tier is 280 ml, and the top tier is 200 ml. I thought the box was microwave safe, but the lady at Kamei (who was in a bad mood and didn't really listen to my question) said it wasn't. Biggie said on her website that the box is microwave and dishwasher safe. I will try it in the microwave eventually, none of my boxes go in the dishwasher, safe or no. I love that it's green on the inside for some reason. I got it at Kamei for $10.50! The picture doesn't do it justice. The blue is actually darker than shown. It's a 3 tier box, most probably not microwave safe. It's not exactly a practical box, but I loved the look of it. I'm not quite sure of the volume of each tier. I'll figure it out and post when I do. I got this box at Kamei for $7.50. There was that one in those colors, and it red and green. And the same thing but bigger in the same two choices of colors. I bought the only blue and black small one left on the shelf (other than the Demo) and opened EACH BOX to find a blue and black. I didn't like the red and green (too Christmas-y). We had the bottom tier already, but I bought the top tier, so now my husband has the complete set. The top tier is 450ml, and the bottom tier 550 ml. Saturday, my husband and I went to Daiso. We never miss a trip there when we're in the city. I bought myself a pickle press! I'm planning on making some quick pickling to put in the bentos as soon as I figure it out. I decided to figure out just how many box sets I really have and put them all on the table for a group photo. I have 15 sets! Actually 16, my huge picnic box is missing! So that's my bento shopping! I had a lot of fun with this and can't wait to have another "Cutsy Curse attack"! With so many boxes, I smell a challenge coming! To Each Our Own n Stuff! I have a layer of "sushi rice" made with brown rice, over that I have red bell pepper and carrot mini sticks, 6 shrimp, and zucchini mini-slices. I steamed the shrimp with salt and pepper and added some mirin to the steaming water. Can't wait to see if it changed the taste! He has leftover couscous that I mixed with a little oil and lemon juice, with that he has green salad. In the other tier, he had left over chicken and salsa (I made more Monday and froze the leftovers), red bell pepper sticks and lentils in the middle, and cut strawberries on the left. I cooked my "broiled Onigiri" less before I put the soy sauce and "browned them" than I did the last time. They are a lot less crusty and dry. I'm thinking my husband will like these! To see how to make Broiled Onigiri click HERE. So that's my bento daily adventure! I've been meaning to make Oyakis for the longest time now, my husband LOVED them. Oh well, one thing at a time! I'll get to it! My husband made dinner yesterday. He made BBQ chicken (meaning with BBQ sauce, not on the grill). It's a recipe he got from the Shortcut Cookbook (Weight Watchers) and modified to suits us. So we had leftovers of that, and I decided to cook this morning. It's our anniversary (6 years... O-M-G!) so I felt like I should make a little extra effort to make the bento tasty. The chicken is very spicy so the rest is tasty but not "hot". I used the larger lower tier to put in the veggies! I have steamed broccoli as always (love the stuff!) and sauteed zucchini and red pepper. In the smaller top tier I put 1/2 cup of brown rice, 1/4 cup of steamed lentils, and the chicken. I'm using the donburi box backward. You're supposed to put the grain on the bottom, and the saucy dish on top to mix just before eating. But I had a lot of vegetables so I cheated. I think I've found a solution, at least for now, for my husband's box dilemma. I decided to use my bigger lock and lock set. It's not huge (700ml) but bigger than the Urura box (580 ml). We'll see how that goes. Ideally I'd still like to find him a cute box that would be 800 to 900 ml, but the lock and lock will do for now. On top, there's 1 cup of brown rice and about 1/4 cup of lentils. In the lower tier he has the chicken, steamed broccoli and sauteed veggies. It's basically the same thing as mine, but he has double the rice. I didn't have more chicken to give him, but I'll try to boost the proteins too as I go. The chicken is so spicy that a little goes a loooooong way. This morning I wanted to finish the stuff in the freezer so that I can start new! So it's not very original, but it's yummy, and from now on you'll see new stuff since I don't have anything left! In the lower tier of my donburi box I put half Spicy Barley Pilaf and half ground turkey and vegetable curry type stuff (whatever that was, it was good!). In the top tier I put steamed broccoli, red bell pepper sticks, and a little cup of steamed lentils. I'm planning to eat this along with a little bag of baby carrots! I've been trying to convince him to get a bigger box. Now that we are tracking our foods (we switched to the Flex plan) my suspicions have been confirmed, he's not eating enough! So I'll be looking for a "man sized" box. If anybody knows of any that don't look like a spaceship let me know! That's my bento-ing for today. Tomorrow I plan on making myself a seafood bento and my husband's a salsa chicken one (made yesterday). Have a happy bento day! Friday was my husband's birthday. We had a good day, but without bento, and I ran late on all my online stuff! Summer is a challenge isn't it? Top left: I had Spicy Barley Pilaf (had it frozen) with a little bit of lettuce and a heart shaped cup of blueberries (not eaten with the barley obviously!). Top right: I had steamed veggies with a heart shaped cup of steamed lentils. Bottom: I had a ground turkey with vegetables dish that I dug out of the freezer. It ended up being a LOT of food! Lower tier (left): Curried couscous with a little cup of steamed lentils. Top tier (right): steamed veggies (steamed last night) and hard boiled eggs (boiled and shaped last night). The picture doesn't show it well, but the eggs are shaped in a bear shape and a fish shape. My husband had the same thing, but his eggs were in the shape of a little car and a bunny! So we're still bento-ing of course, but we skip a day every once in a while. It's summertime, I don't work daytime, so sometimes I like a freshly cooked lunch. I'm not giving up though, I love this too much! I slept about 2 hours last night because of the heat. This morning I woke up at 6:30, so I had to scramble to put together two lunches. Nothing was ready or thawed out. In the top tier (left) I have not very steamed but very spiced veggies in a silicone cup, and strawberries and blueberries on the side. In the lower tier (right) I had a vegetarian curry, and fried brown rice*. *In the picture its plain brown rice cause I put the leftover rice in the bento instead of the fried rice by mistake. I switched it around after I took the pictures. DUH! So that's a fairly simple lunch, smallish even, but I was pressed for time! We both had a little bag of carrots along with it, and I had a little hummus with my carrots. It was enough for me but I should have added lentils or something to beef it up a little for Dan. I will do so tomorrow. I took a vacation from making Bento boxes mainly because my husband took some days off and we had like 3 whole days to ourselves! WOAH! So, bentos went out the window and we went around having fun. Today is back to reality though. He's back to work, and the bento boxes were filled up. Today's fare is a weird mix of Thai, Indian, and BBQ stuff. Welcome to my world! I didn't think it would, but it went well together! In the lower tier (left) I had BBQ chicken breast that my husband grilled Saturday evening I think. With that I had Spicy Barley Pilaf that I took out of the freezer last night. In the top tier (right) I have steamed broccoli with spices, and a Thai vegetable stir fry I made last night. In the little container I had Mediterranean hummus. So we're back to our routine, and I'm looking at tomorrow's boxes already. Hopefully I can come up with something, supplies are low in my freezer!